In today’s lesson, our fourth look at various ways that you can explore when soloing over Major Chords, we’ll be looking at different sounds that come from the 3rd Mode Melodic Minor Mode, which brings a #5 augmented sound to your major chord vocabulary. We will check out triads, arpeggios, pentatonic and major scales, for the 3rd Mode Melodic Minor, how to build and practice these different melodic ideas as well as how to apply them to your soloing ideas. So without further ado, let’s dig into soloing over Major Chords using the 3rd Mode Melodic Minor and the #5 sound! The first soloing idea over Major Chords, using an 3rd Mode Melodic Minor sound, is the related triad for that chord, the augmented triad. Built Root-3rd-#5th, or the 1st, 3rd and 5th notes of the 3rd Mode Melodic Minor scale, the augmented triad is a great way to bring a bit of tension to your major triad soloing idea. Here are a few fingerings to check out for a C+ triad, one from the 5th and one from the 6th-string root. Learn them in C+ first, and then take them to all 12 keys as you explore them further around the fretboard. Once you have learned one or both of the above augmented triad fingerings, put on the backing track at the bottom of this article and practice soloing over those chords using only their related triad shapes. Start by sticking to the 6th-string root shapes for each augmented triad, then move on to the 5th-string root, and finally move between both shapes as you navigate the chord changes on the backing track. The next idea that we’ll explore when soloing over major chords with 3rd Mode Melodic Minor is the maj7#5 arpeggio. Built from the 1st, 3rd, 5th and 7th notes of the 3rd Mode Melodic Minor, maj7#5 arpeggios are only one note different from the augmented triad, but they have a unique sound all their own. 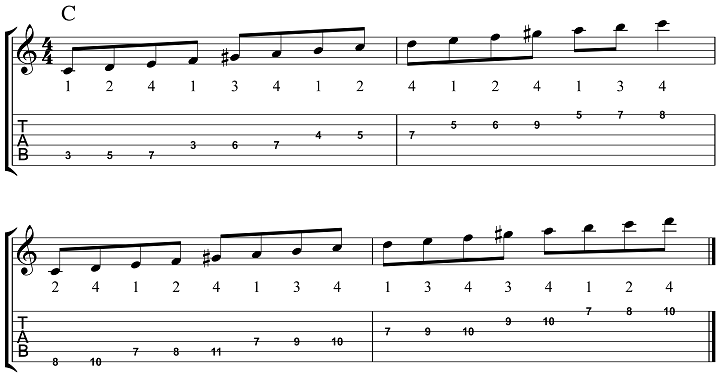 Here are two shapes for the Cmaj7#5 arpeggio that you can explore in your practice routine. 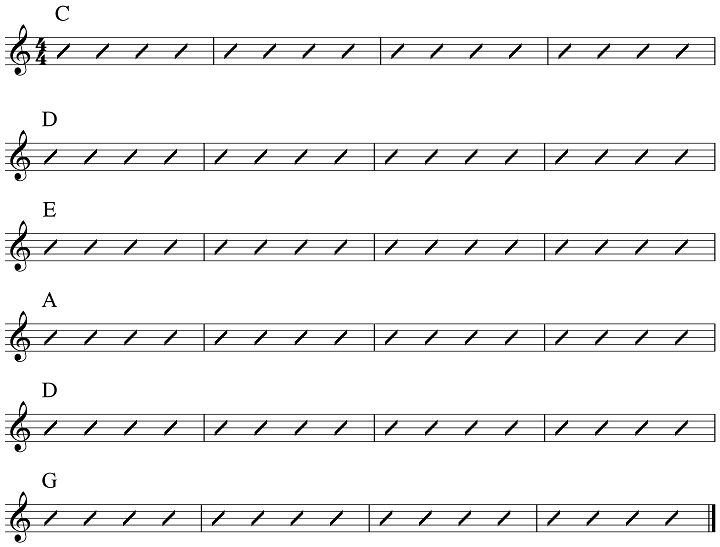 Again, learn these shapes in the given key, then take them to all 12 keys as you work them further in the woodshed. Once you have learned one or both of the above maj7#5 arpeggio fingerings, put on the backing track at the bottom of this article and practice soloing over those chords using only their related maj7#5 arpeggio shapes. Start by sticking to the 6th-string root shapes for each maj7#5 arpeggio, then move on to the 5th-string root, and finally move between both shapes as you navigate the chord changes on the backing track. Caught between the arpeggio and major scale, the 3rd Mode Melodic Minor Pentatonic Scale has 5 notes, the 1-2-3-#5-6 of the underlying major chord, and so it is a great choice when soloing over major chords in your playing when you want to step “outside” the chord changes a bit but not too far. Here are two fingerings to get you started with this fun and easy to play shape on the guitar. Once you work it in C 3rd Mode Melodic Minor, take it to the other 11 keys as you continue to explore this sound around the neck of the guitar. Once you have learned one or both of the above 3rd Mode Melodic Minor Pentatonic Scale fingerings, put on the backing track at the bottom of this article and practice soloing over those chords using only their related 3rd Mode Melodic Minor Pentatonic Scale shapes. Start by sticking to the 6th-string root shapes for each 3rd Mode Melodic Minor Pentatonic Scale, then move on to the 5th-string root, and finally move between both shapes as you navigate the chord changes on the backing track. The last melodic idea we will explore in this lesson is the I 3rd Mode Melodic Minor scale. This 7-note melodic device is a great way to solo over any given major chord when looking to go outside a bit, as it contains the notes of that chord, the maj7#5 arpeggio and 3 color tones, 9-11-13, in it’s construction. Here are two different fingerings for the C 3rd Mode Melodic Minor scale to start you off with. After you have these shapes down, make sure to take them to all 12 keys around the fingerboard. Once you have learned one or both of the above 3rd Mode Melodic Minor Scale fingerings, put on the backing track at the bottom of this article and practice soloing over those chords using only their related 3rd Mode Melodic Minor Scale shapes. Start by sticking to the 6th-string root shapes for each 3rd Mode Melodic Minor Scale, then move on to the 5th-string root, and finally move between both shapes as you navigate the chord changes on the backing track. Do you have any questions or comments about the 3rd Mode Melodic Minor? Post your thoughts in the comments thread below.